With plant-based. Powergreen® technology. Cruelty-Free International. Mirror, mirror on the wall, my wood's so shiny I don't need you at all. Put your best wood forward. As with most natural beauties, it only takes a little upkeep to keep your wood at its best. 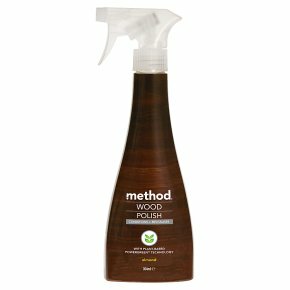 Our wood polish safely conditions + revitalises your favourite tree-based possessions. The non-toxic, plant-based formula even provides a protective shine. You might call it your knight in almond-scented armour. Made by and for people against dirty®. Sealed wood surfaces, wood furniture and cabinets To use: shake well. Spray on soft cloth. Wipe. Buff with a dry, clean cloth. Not for use on floors. Psst: It's always a good idea to test in an inconspicuous place first. AVOID CONTACT WITH EYES. IF IN EYES: RINSE CAUTIOUSLY WITH WATER FOR SEVERAL MINUTES. KEEP OUT OF REACH OF CHILDREN.